It may not be accurate to say that MoQ (Quick start intro) is thread safe when running tests in parallel because it appears it is not in other circumstances. Check out this blog post where they modified the source to fix a threading issue. These tests pass every time. 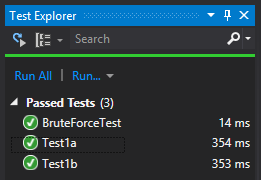 Even the updated brute force parallel tests runs ok.